Language, like the culture it derives from, plays a subtle but powerful role in how we interact with others. Yet we are so completely immersed in it, we scarcely give it a second thought. “The limits of my language mean the limits of my world.” Wittgenstein, Tractatus, 5.6 (1921). It may seem overstated at first glance, but let’s unpack it. If we reflect on how we think about, evaluate, and come to understand virtually anything, we realize that the running voice of our conscious thought sets practical boundaries. We can contemplate problems and solutions in our mind only to the extent we have words to describe them. Our vocabulary either limits or unlocks our ability to describe what we see. Our command of grammar and ability to construct descriptions of abstract concepts works the same way. Our command of semantics is a central to critical thinking. Language literally bounds our possibilities. Wittgenstein thus underscores a compelling argument for mastery of the original liberal arts of grammar, rhetoric, and logic – skills that we might better grasp today in the modern context of reading and writing – but his message is clear: the tools of language are essential to the thinking person. Now let’s apply those ideas in the social and collective contexts. What happens in a team setting? Carefully articulating a new idea for ourselves is only half the battle. As collaborators we face the more difficult but critically essential task of explaining this idea to others. What words do we use? What language will our audience understand? And if we’ve followed good practice by ensuring a diverse group of collaborative stakeholders, the bar has been raised even further: what subset of our shared language will be most effective to ensure common understanding across a diverse team? From my experience, the most common failure in team settings is mis-communication of ideas, most readily observed when group members freely, often unwittingly, talk past each other. In a fervent effort to make a point, we default to arguments grounded in our semantics of origin. So what happens? IT folks will talk technology. Accounting will talk about margins. Sales will talk about customer problems. Educators will talk about pedagogy. Academics will talk about epistemologies. With heightened energy, the vocabulary grows increasingly parochial and inaccessible, and the steeper the organization’s silo walls, the more entrenched the participants tend to be, and the more difficult language barriers are to cross. No wonder finding common ground can seem like a pipe dream. So intentional collaboration places clear demands on semantic foundations. Defining key terms often helps. Project glossaries can go a long way. Another strong approach (referenced previously in this blog, and elsewhere) is that of a solution language. The idea is to create common ground on the output side. We can define terms for the proposed solution set(s) that are literally grounded in a new language that is embraced by all. It is an extraction from the contributors’ source languages, an amalgamation of pieces and parts to create a viable whole. As the solution language is built, common ground is established in the process. In so doing, collaborators become more aware of their context of origin, better described as their comfort zone. With time and energy, many will see how cultural and linguistic boundaries can impact their collaborative engagement. In dialog, people become observers of their own thinking. Senge and Bohm share a deep sense for the requirements for team-based learning. 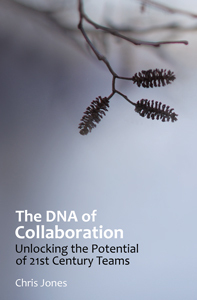 Senge himself devotes many pages to language, and the evolutionary steps through which individuals must navigate to achieve value from a shared, collective learning model. Often, it means suspending bias inherent from professional education and what is often years working within a given specialty. Thomas Kuhn’s thinking on the challenges and demands of paradigm shifts peers from these lines. Wittgenstein’s foundational messages ring true throughout. It’s easy to imagine ourselves standing before the locked door of critical thinking. We hold the keys in our hands, but remain dumbfounded about how to use them. When we attempt to collaborate, we stand before the same door with others, but we’re still at a loss; perhaps it’s even worse, arguing the course of action. Language is the master key to unlocking effective collaboration, opening the door to possibilities of what we can accomplish via intentional, purposeful dialog with others. We can cast all this aside, broadcasting our views to the world at will. We can choose empty words with casual intent to impress, or use caustic words that serve only to bully, blame and obscure. People do it every day. The price? It’s a fundamental failure to be understood, preempting an exchange of ideas that could have emerged into something more. That spells disaster for progress in any language. On the road to unlocking collaboration, our culture series has taken us through a review of Schein’s many layers, Handy’s four structural models, and Kotter’s eight steps for change – lots of ways to slice and dice the cultural barriers. To me, it was important progress and worth the deep dive, tapping dozens upon dozens of insightful comments, for which I remain grateful. Cultures can, over time, be intentionally shaped and directed by visionary and resilient leaders. But the complexity of organizations, markets and other social ecosystems invariably worsens with scale, raising the bar for mitigation ever higher. We need some breakthrough thinking. How can we foster collaboration and cultures that encourage it? Where do we turn now? Peter Senge, in his 1990 watershed work The Fifth Discipline (latest ed. 2006), laid an important foundation for Learning Organizations that still resonates today. As we look to frame the core dynamics of effective collaboration and the many challenges of the necessary culture change, I think we need to go back to the source. While Senge advocated 5 critical disciplines for the modern organization, I struck gold on several foundational takeaways, each resonating with my views on collaborative innovation. Not all of them qualify as ‘disciplines’ as he defined them, but they all seem to have strong relevance to the challenges at hand. recognizing that cultures can and must promote learning through deeper inquiry, encouraging us to challenge the rigor of our thinking; ‘critical thinking’ has lost focus in the commercial space and across western society, creating a fundamental problem in education priorities (but that’s another stream!). importance of the study of nature’s patterns, many holding secrets to how our world and our problems relate, with key messages for ecosystem sustainability and a means to understand complexity around us. Senge looked to future organizations to master these challenges, becoming increasingly skilled at complex problem solving, and increasingly motivated to take on harder problems, adapting to handle more complex environments and challenges. Successful organizations, he hoped, would demonstrate resilience, and an expanding, repeatable capacity for learning. Like many visionaries, Senge challenged future leaders to pick up the cause and drive these conceptual ideas into practice. Where are those leaders when we need them? Some of them may be staring back at us in the mirror. As we depart from Senge (with much to mull over!) let me direct your attention to the work of Marcia Conner, who has produced a series of books that lay out much of the work ahead in crafting a viable, sustainable learning organization. Perhaps you’ve connected with her at #lrnchat, on Twitter? Read up, and listen in. Ultimately, we must promote cultures that value both learning and collaboration. That’s where innovation and great ideas come from. Talking around notions of collaborative cultures is easy, in the same way people banter about collaborative innovation. Small wonder there’s such a buzz about it. But fostering cultures that spawn collaborative behaviors is hard work. I wonder: do we have the resolve to take it on? Ahead: I’ll provide more specifics on the mechanics of effective collaboration. The journey continues, and we’re picking up the pace. Here’s some additional dialog just posted on Quora, based on this thread. As always, I’d love to know your thoughts. JOHNSON, Steven B. Where Good Ideas Come From (2010). SENGE, Peter. Fifth Discipline (1990). KUHN, Thomas S. Structure of Scientific Revolutions. (1962). COVEY, Steven M.R. The Speed of Trust. TARNAS, Richard. Passion of the Western Mind (1991). WALDROP, M.Mitchell. Complexity: The Emerging Science at the Edge of Order and Chaos (1992).